The Sharman Burgess Sports Cup took centre stage this week, with Premier Division leaders Pointon keeping up their good form to beat Billinghay 4-1. FC Hammers put 11 past Digby while Fulbeck beat Horncastle Town Reserves, Tom Vertega (three), Ben Pollard (two) and Martin Wilson the matchwinners. Old Leak went out of the cup to two first half goals from Fishtoft’s Casey Mcdonald and Darren Tate. Railway won 5-3 at home to Division Two’s FC Wrangle. Nathan Rivett and Troy Randles secured Boston College a place in the next round with a 2-0 win over Spalding Harriers. Two goals from Gavin Bell put Benington through at Wyberton Reserves. 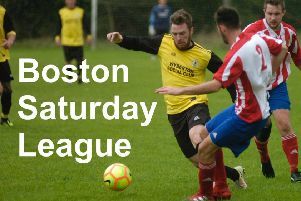 Coningsby, Leverton, Ruskington Rovers, Swineshead Institute and Skegness Town Reserves also progressed. In the Workforce Unlimited Division One, Sibsey left Kirton Town with a 5-2 win. Park United kept up their unbeaten run in Division Two with a 3-0 victory over Colsterworth. Fosdyke make it three straight league wins after a close 2-1 win over Wyberton A and Caythorpe took beat Coningsby Reserves for their second win of the season. Skegness Town A make it 11 out of 11 league wins in Division Three after putting 10 past Leverton Reserves. A hat trick from Sam Reed, a goal from Caleb Sutcliffe and an own goal earned Benington Reserves to a home win over Fosdyke Reserves, while Swineshead A put six past a struggling Mareham United. Sharman Burgess Sports Cup, round two: Coningsby 4 JFC Seniors 0, Eagle Utd v Northgate Olympic - home win, FC Hammers 11 Digby 2, Boston College 2 Spalding Harriers 0, Fulbeck Utd 6 Horncastle Town Res 1, Holbeach Bank 1 Skegness Town Res 2, Old Leake 0 Fishtoft 2, Pointon 4 Billinghay Ath 1, Railway Ath 5 FC Wrangle 3, Ruskington Rvrs 6 Freiston 2, Skegness Utd v Boston Ath - home win, Spilsby Town v Boston International - home win, Swineshead Inst 3 Old Dons 0, Woodhall Spa Utd 1 Leverton SFC 2, Wyberton Res 0 Benington 2. Workforce Unlimited Division One: Friskney v FC Kirton - postponed, Kirton Town 2 Sibsey 5, Swineshead Res 6 Pointon Res 3. Workforce Unlimited Division Two: Billinghay Res 1 Railway Res 2, Caythorpe 2 Coningsby Reserves 1, Fosdyke 2 Wyberton A 1, Park United 3 Colsterworth 0. Workforce Unlimited Division Three: Benington Res 5 Fosdyke Res 2,Mareham United 1 Swineshead A 6, Old Dons Res 2 College Res 2, Skegness Town A 10 Leverton Reserves 0.